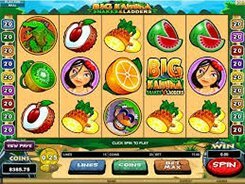 Big Kahuna – Snakes & Ladders is a popular five-reel 15-line spin-off to the Big Kahuna video slot. The newer version features some new characters with even more bonuses and a potential 30,000 coin win! The regular symbols in the game are a mask, Duzi and Keira, komodo dragon, monkey, and loads of fruit. Before clicking the Spin button, you should make a bet. 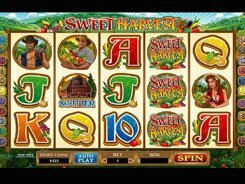 The following three settings are available: the number of lines you wager on, the number of coins per spin (20 coins max), and a coin value ($0.01 to $0.25). Once the settings are done, push the Spin button. The Big Kahuna – Snakes & Ladders logo is one of the highest paying symbols, with these five awarding 5000 coins. Being a wildcard, the logo symbol can complete winning combinations by substituting missing symbols. Besides, the wild multiplies your win x2 times the initial bet per line. The Snakes and Ladders symbol represents a scatter. 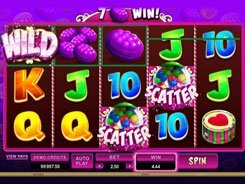 Three scatters occurred anywhere on reels 1, 3 and 5 start a bonus feature, where up to 30,000 coins can be won. Winning the unbelievable jackpot is a tricky challenge. Your task is to progress up the map rolling a dice. Succeed in the mission, and the grand award is yours! 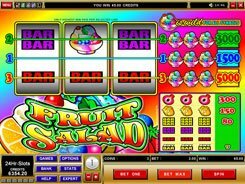 The free spins round is another pleasing supplement from Microgaming that is randomly activated during regular game rounds. 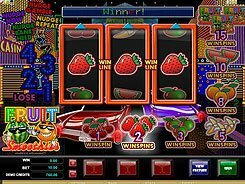 You are awarded 5 non-retriggerable free spins with a x2 bet multiplier. 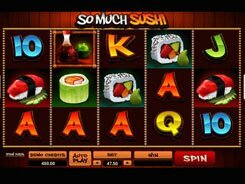 In addition, a wild symbol displayed on the reels during the free spins round pays out your line bet times x4. PLAY FOR REAL MONEY!